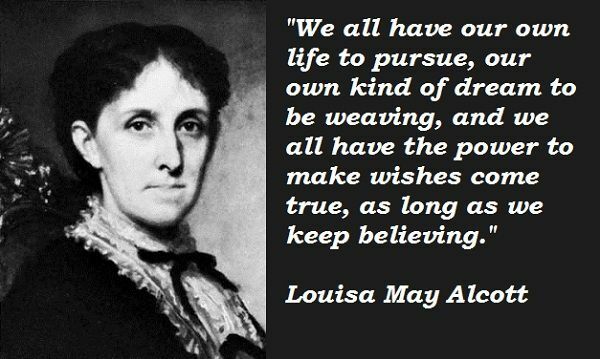 American novelist and poet Louisa May Alcott was famous for her quotes.Her biography tells us she made her name with her book little women and the sequels.She was born in November 29th 1832 and died on March 6 1888.The famous novelist had three sisters,Abigail May,Anna and Elizabeth Sewall.Her books are still popular today even though she died over 100 years ago. Her writing skills were as a result of tuition from her father Amos Bronson Alcott. My favourite line of hers is Never used a long word when a short one will do.